Are You Ready To Unlock Your Spiritual Gifts? Now at last, the famous teacher who helped me and thousands of students learn this technique has created the most powerful Home Study Course for Spiritual Development, ever created. A course that reveals the secret to how you can unlock your psychic gifts and access clear guidance from the spiritual realms. This technique is available to all who dream of a more spiritually fulfilled and connected life, or those who seek to improve their career, magnetize their soul mate, attract more money or simply live a more satisfying life! This astonishing method to learn channeling is The Orion Technique, and it’s the same method I learned from Betsy over 8 years ago, and now for the first time you can learn this technique yourself safely and comfortably in your own home, at your own pace. Betsy Morgan developed The Orion Technique through direct-channeled guidance and frequency from Archangel Orion and has been teaching thousands of spiritual seekers how to channel and develop spiritually with this powerful method for over 20 years. ​When I first met Betsy and Orion back in 2008, I was at a point in my life where I was completely lost and confused about my direction. I knew I wanted to be psychic, and to experience a deeper connection with the Divine, but I really didn’t know why, and a part of me didn’t even believe it was possible for me to do…. When I learned about Betsy, and the Orion Technique, my heart urged me to sign up for the class and although I was skeptical, I went for it. I can honestly tell you that going through this program absolutely changed my life for the better, and is one of the best things I have ever done for myself. 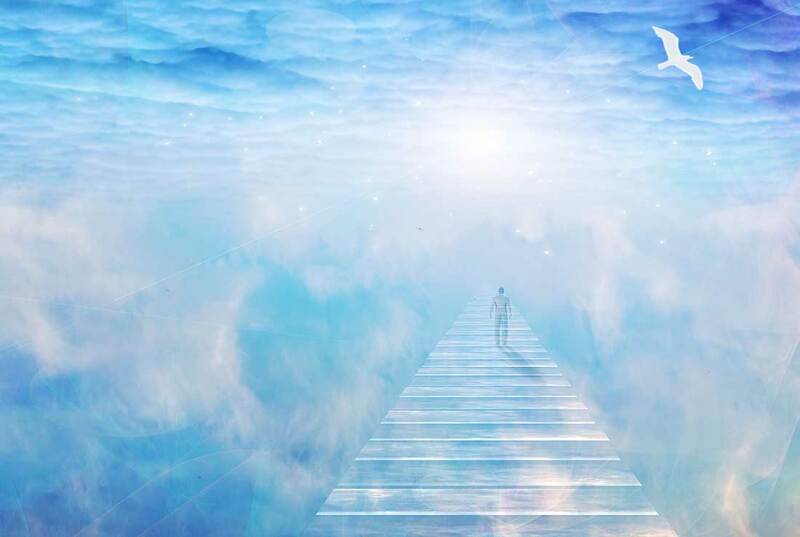 Connecting with the angels, ascended masters, and with my team of spirit guides went from being something that seemed impossible, abstract and confusing…. To something that was easy, fun, and empowering. I learned to tune into my inner light and power, too. Going through this program was like turning on a light switch for me. It was simple and easy, and yet it triggered a quantum shift in me and revealed so much about the spiritual realms that had previously been hidden. By going through the Orion Technique with Betsy Morgan and Orion, I instantly opened to channel, uncovered my psychic abilities, and tapped into the inner well of spiritual truth and wisdom I had always carried within, but didn’t know how to access or tune into. "This Course Was Absolutely Life Changing For Me!" Since finishing Betsy's classes, I’ve gone on to become an internationally known psychic channel, a bestselling-author of multiple books containing channeled messages, the creator of the Angel Energy Healing method that I channeled, and an effective spiritual teacher beyond my wildest dreams. I feel so grateful for Betsy Morgan and Orion’s role in creating this incredible program and for this opportunity to share this course with you now... Because it truly helped me get on my authentic soul path. Because it truly helped me get on my authentic soul path. I strongly encourage you to listen to your heart, and get started with this life changing course today! "A Proven Method To Unlock Your Psychic Abilities!" What will it be like when you can easily get clear psychic insights, experience a deeper sense of intuitive knowing, and you are able to tune into accurate guidance from your team of spirit guides, angels and ascended masters any time you want? …. And just about ANY other situation or question you can think of! You’ll naturally feel more in sync with the flow of life, more connected to the Divine and your angels, and you will become more aware of your unique path and purpose. Ok, you may be thinking…. But How? The Orion Technique is the perfect way to develop your psychic gifts, because it literally paves the pathway to accessing the spiritual realms for you through learning how to channel. This program will connect you with your team of spirit guides and angels, so you can open, deepen, and strengthen your psychic gifts and spiritual abilities overnight. All you have to do is watch the videos! Whether you’re a complete beginner, or already practicing as a professional psychic, this program will allow you to uncover your psychic gifts, deepen your connection with spirit and strengthen your psychic abilities beyond anything you have ever experienced. How to open your innate psychic gifts as a channel, medium, medical intuitive, clairvoyant, or energy healer. How to take a quantum leap forward from where you are right now. How to channel messages of love and guidance from your team of spirit guides, angels, and ascended masters. Learn to see deeper into the spiritual meanings of situations, and even predict the future. How to align with your authentic purpose, and spiritual gifts so you can positively affect the world! How to trust your heart and intuition so you can stop doubting yourself. How to experience profound love and joy from connecting with spiritual energy. Learning The Orion Technique will serve you for the rest of your life! In going through this course, we recommend you only watch one course video per day so that you can integrate and attune yourself to the increased energies and vibrations you will align with through The Orion Technique. "You see... The direct frequency and teaching from Archangel Orion with Betsy Morgan makes this course unique." Through the Orion Technique, you will receive a powerful energetic frequency to attune you to your psychic gifts, and awaken YOUR unique psychic aptitude. It also attunes you to a variety of psychic skills and abilities that the process of channeling can activate for you. Whether your unique psychic abilities lie in channeling, mediumship, energy healing, clairvoyance, medical intuition, empathic healing and more, Orion will help. In these powerful sessions, your heart will open, your spiritual gifts will blossom, and you will experience a deeper connection between your heart, intuition and the Divine Consciousness that connects everything in existence. Betsy-Morgan, who channels Orion is one of the most experienced psychic and channeling teachers in the world. She has helped thousands of students to remember the truth of their inner power, and reconnect with their psychic gifts, inner wisdom, and to directly link with the love, guidance and support of the spiritual realms over the course of 20+ years of teaching. Betsy-Morgan is often called the “teacher of teachers” because so many of her students have gone on to master their psychic gifts and spiritual abilities with the Orion Technique, and they now teach psychic development, channeling, and spiritual growth to students of their own. With the Orion Technique as taught by Betsy Morgan, you have the opportunity to develop psychic abilities and use them in your life the way YOU want to! The process of channeling with the Orion technique is easy, fun, and will help you to effortlessly open your psychic abilities, spiritual gifts, and intuitive skills. Opening your psychic abilities doesn’t mean you have to become a professional psychic, or even let anyone know you’ve done it. Many people learn to channel and become psychic just for their own personal use, to access guidance, and live happier and healthier lives with increased harmony, love and abundance. The Orion Technique is unique in that it works for everyone and yet it helps each individual to open their own unique and special gifts for connecting with the Divine. And while you don’t have to, many of Betsy and Orion’s students go on to become professional psychics, channels, mediums, energy healers and more! This Learning to Channel home study course is simple. It’s a series of videos and one eBook where Betsy Morgan invites you into her home to connect with the Divine and awaken your inner power that currently lies dormant within you. And you’ll never lose the psychic abilities and spiritual gifts you connect with. Included in this course are seven video classes, a workbook, and three audio messages. Each video contains the perfect amount of energy and teaching for you to absorb and integrate the lessons before moving on. This is the first step. You will learn about how the Orion Technique was developed, what is possible for you and how you can get the most out of your Psychic Development and Channeling program. You will learn about the transformational energy present in each of the class sessions, and how you will receive powerful light imprints to support you in opening to the next level, as you continue to progress through the course. Learn what channeling is, how The Orion Technique works, as well as the different psychic abilities you may develop as a result of learning to channel with The Orion Technique. Relax and listen to receive an incredible initiation from Orion. In this class you will open your chakras, learn a game changing technique, and then... You will channel a message of love directly from one of your channeling guides! Watch and learn as Betsy Morgan teaches a student to channel, so you can see deeper into the process and prepare yourself for your next step. Increase your channeling skill and psychic connection, as you begin to channel for yourself and for others. Class 5: Examples of Channeling and Practice in Action! Watch several of Betsy's students as they go through the process of learning to channel and learn along with them. You will receive an amazing light attunement from Orion that opens your mediumship abilities and allows you to connect directly with your loved ones in Heaven. Learn how mediumship is similar to channeling, and feel for yourself what it is like to be in the mediumship state. Review what you've learned so far with Betsy and Orion. You will then experience a powerful channeling by Betsy Morgan to help you go deeper and lift higher. Closing. Learn what's next, and wrap up the course with love, light and joy. Listen - You’ve always had access to psychic information and guidance, in this course you will learn to listen to the messages of your guides, higher self and angels with wisdom and joy. Trust Your Intuition - Learning to trust yourself and the guidance you receive is one of the most important steps in developing and progressing as a psychic. In the course you will learn to listen, decipher, interpret and trust the messages of love and guidance from the Higher Realms. Act On Your Guidance - Once you’ve learned to listen, decipher, and trust, you will know what action is best to take at that moment, no matter what the situation. You’ll be ready to act on the higher guidance you receive to co-create positive changes and blessings in your experience. 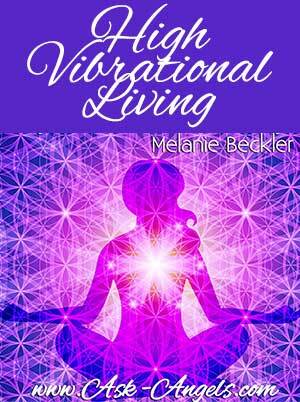 You will learn to unlock your natural psychic gifts, or take your current abilities to an entirely new level. The wonderful thing about The Orion Technique is that the energy from Orion works in a way that is unique to you. YOUR unique gifts and abilities that are in alignment with your passion and purpose in the world will effortlessly open as you watch the videos! The Orion Technique Workbook will help you to move through the process of learning to channel. Here you will have help practicing your work, referencing where you are, and working with exercises after each of the videos to integrate what you’re learning. Connect with Betsy Morgan on these light infused channeled call recordings to help further support your Learning to Channel and opening the full extent of your Psychic Gifts and Abilities. 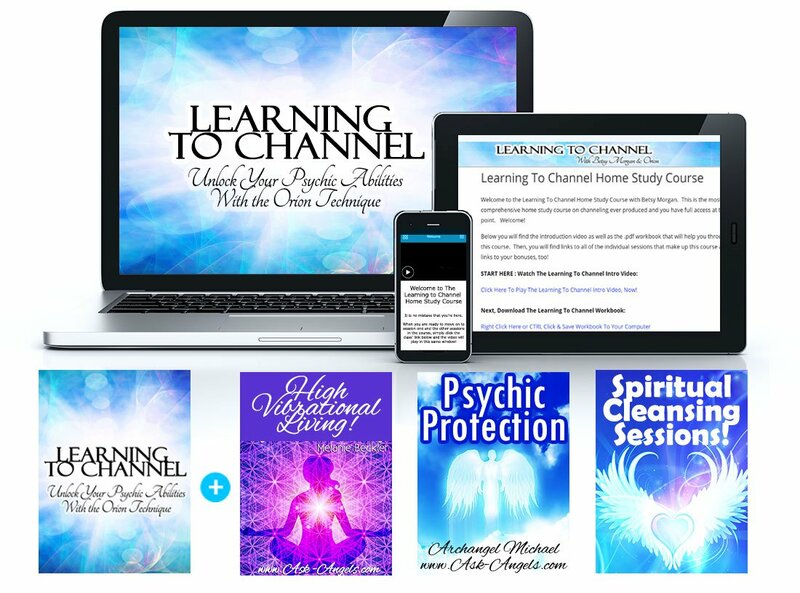 You'll have instant access to dozens of Learning to Channel call archives to support you in accessing and unleashing your spiritual abilities. 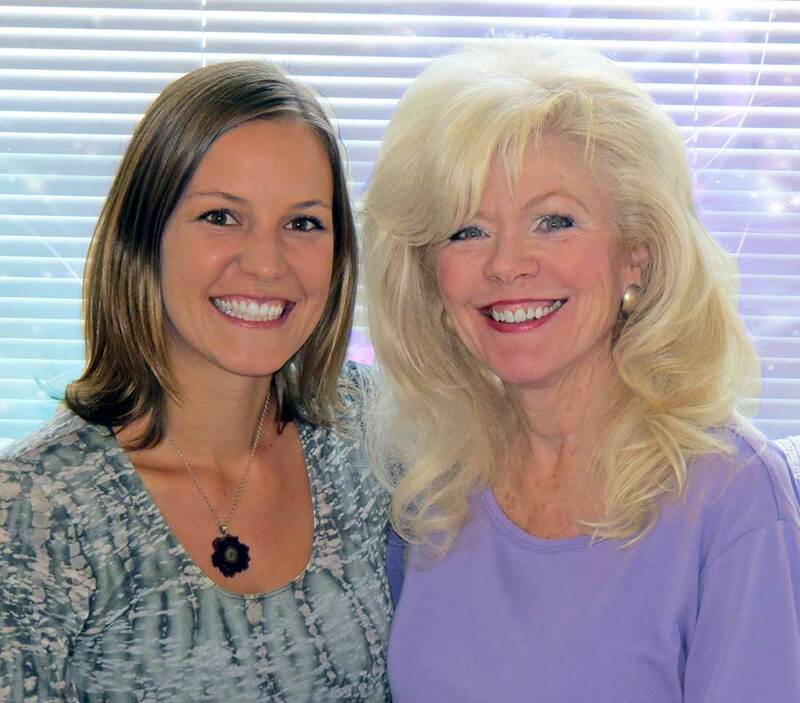 These downloads from Betsy Morgan’s teleseminars are fabulous to listen to again and again as you continue to integrate more light and lift higher. You will get more out of these each time you listen. 4. Private facebook group where you can connect with Betsy-Morgan and other Learning to Channel students to deepen and support your journey through and beyond the Home Study Course experience. You will successfully open your psychic chakras, develop the ability to channel guidance, and you will create a loving bond with your personal guides and angels. Best of all, you will begin to channel messages of truth and love for other people and yourself. When you use what you learn in the Orion Technique to get answers in even just one area of your life- whether it’s in the area of relationships, money, spiritual development, love, or health- your investment will pay for itself! There is something magic that happens when you go through the Orion Technique and you will quickly see the benefits flowing into all areas of your life. This was before she created the home study course that you are able to access for more than 50% less than what it cost me to learn The Orion Technique. Psychic development and channeling are things we want to make available for everyone, so you can try it now 100% risk free. Is just one payment of $595! Learning to Channel Home Study Video Course~ $595! If you want to learn to channel, be sure to enroll now! The Spiritual Cleansing Sessions, created with the angels by internationally acclaimed angelic channel Melanie Beckler, will guide you to effortlessly break through and release stagnant and dense from your mind, body, and spirit. These are laser targeted cleansing sessions with the angels that complete powerful cleansing work for you so you don’t have to worry about whether you’re doing it right. You will notice a shift the very first time you listen, but them imagine what is possible as you continue to deepen your connection with the angels to rekindle the full brilliance of the inner light within. Going deeper and progressing faster with spiritual cleansing is simple, just press play, and re-listen to any of these meditative sessions whenever you want. These sessions will sweep away tension and renew your mind, body and spirit in just 3 sessions under 20 minutes each, and a 90 minute sleep meditation. All you have to do is listen! 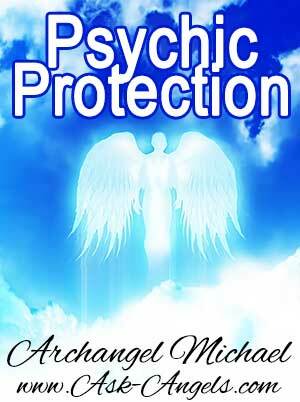 In this stand-alone Psychic Protection course with Archangel Michael as channeled by Melanie Beckler, you will learn the invaluable practice of Spiritual Self Defense. Simply relax and listen as Archangel Michael guides you through practical techniques to ground, clear, shield your energy, and to protect and restore yourself so that you can live your truth in alignment with increased joy, light, and love. The benefits you will receive from putting into practice what you learn in this course can improve your life more than you may even be able to imagine right now. Regardless of where you are on your path of psychic awakening and spiritual development, you will benefit from learning and implementing psychic protection techniques! High Vibrational Living is a course that’s all about allowing the brilliance of your soul’s radiance to shine through all that you do. You are able to illuminate your path and let go of all that no longer serves you, while igniting your inner passion, and awakening truly vibrant well-being, and an illuminated perspective. If you have wanted to align with your passion, your true purpose, and the infinite power of your inner soul light, incredible angel course channeled by Melanie Beckler is for you. This is a powerful stand-alone course with five angelic infused sessions to help you step into living a higher vibrational life now. PLUS... The 6-Week Channeling Boost Call Series, and access to a supportive and heart-centered community through our secret Learning to Channel Facebook group! Not only will you get instant access to the Learning to Channel home study course featuring The Orion Technique by Betsy Morgan and all of the bonuses, but you will also have a full 30 days to go through the course to make sure it exceeds your expectations. If for any reason if you are not 100% satisfied with the course or with your results, you can simply email me for a full refund and you get to keep all of the free bonuses! 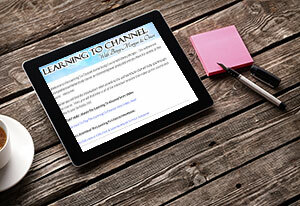 Access to the Learning to Channel Course, Now! 9 Videos that make up the Orion Technique, Learning to Channel Online Course. 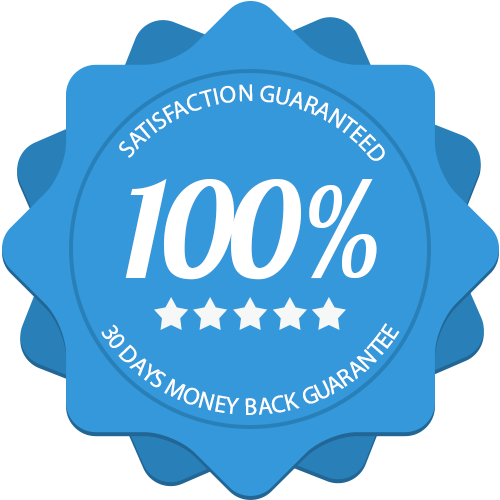 A 100% 30-Day Money Back Guarantee, so you have zero risk and you can be sure certain this course will work for you or we’ll give you your money back, no questions asked. Top-notch customer support whenever you need help so you know you are supported in gaining access and moving through the course material. PLUS: The 6- Week Channeling Boost Call Series with Betsy-Morgan when you purchase before October 15th! 1. Click the Order Now Button Above. Click the Order Now button above... You will then reach our secure checkout page where you can enter your billing information and complete your purchase. Upon completion of your purchase you will instantly gain access to an online portal where you can access your entire Learning to Channel course. You will also receive an email right away that contains your login information and details about how to access your course. That’s all! Once you’re inside your course portal, you will have access to the intro video and the workbook with further instructions about how to make the most out of going through this course! Just click play on the first video and then continue onward from there. Yes! You don' t need to have any prior experience at all! The great thing about the Orion Technique is that it meets you where you are so you can quickly, safely, and with fun and joy open to channel and access your psychic abilities at a deeper level. This course is perfect for beginners, and professional psychics alike! Do I have to wait to access the course? No. 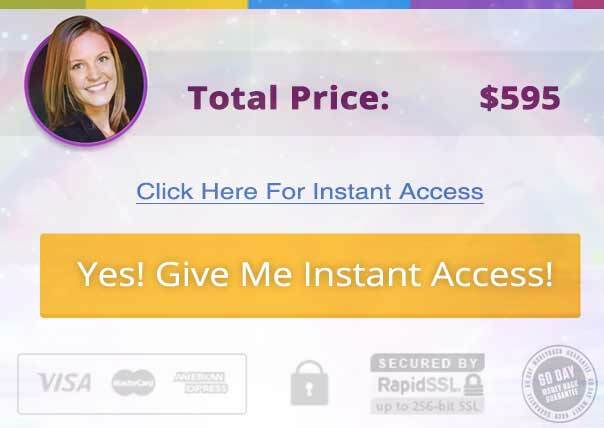 When you click the order now button on this page, and complete your purchase you will be redirected to a private members area where you can immediately access the entire program... And you can get started right away, or whenever the timing is right for you. I don't have a computer... Will I will be able to access everything I need to complete the course on my iPad/ Phone? Yes! We've worked hard to make this course accessible from phones, tablets, and computers alike... Once you purchase you will be able to login to the members area and gain full access to the course materials regardless of the type of device you're on. I’m already an advanced psychic/ channel/ or medium... Will I get anything out of learning the Orion Technique? Absolutely! The Orion Technique features cutting edge exercises and light downloads to help you increase the clarity and strength of the spiritual gifts and psychic abilities you already have. When it comes to spiritual growth there is always a further, so even if you're already advanced, the Orion Technique will help you to take a quantum leap forward. One of the wonderful things about learned channeling with the Orion Technique is that is works FAST! So fast, that you will actually have a channeling experience by the end of the second video. By the end of the program, everyone who goes through the full course will channel. and depending on your unique gifts and abilities, this will manifest in additional ways, shapes and forms.